Spring Snow Crabapple This tree is an ‘Idaho Preferred’ Plant. Spring Snow is a fast growing, dense, oval-headed tree. Its blossoms are whitea and sterile. The blossoms open as the first leaves unfurl. There are few if any fruits which makes this a nice tree without any of the fruit cleanup. Prune young trees to shape in late winter. Grow as accent, at edge of patio, rock garden feature, in group, roadside planting. Spring Snow Crabapple attracts hummingbirds, bees. 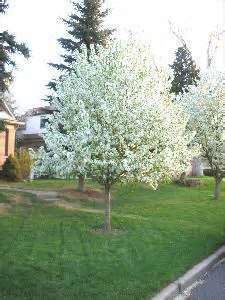 Crabapple trees are a Firewise plant. Use Prune Smart on any suckers. Does best in full sun.